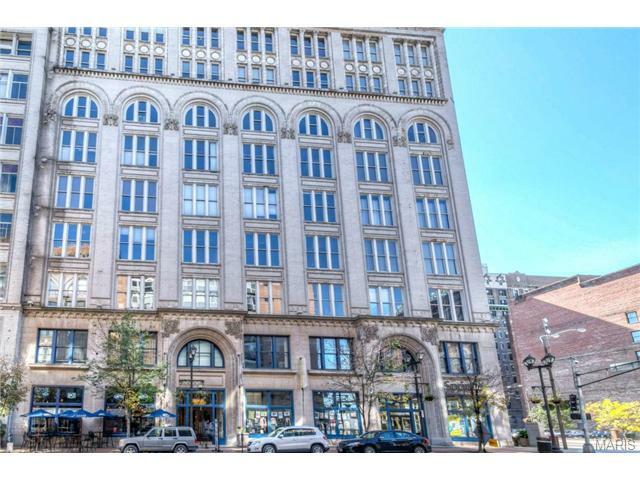 Located in St. Louis City real estate, lofts for sale in Downtown St. Louis MO are conveniently located to The Cardinals Baseball Stadium, The Fox, The Arch, Union Station, Edward Jones Dome and much more! Downtown St. Louis Real Estate and Downtown, St. Louis properties are a perfect addition to the St. Louis Real Estate market. Downtown St. Louis real estate is primarily lofts, condos and apartment buildings. The lofts for sale in Downtown St. Louis MO range in price from approximately $50,000 for gut rehab Lofts to $600,000. The median home price in 2014 was approximately $215,000. Downtown St. Louis is known for the revitalization of residences in the area. Washington Street provides numerous remodeled lofts, condos and apartment buildings. Residents of the area enjoy walking to local award winning restaurants, boutique and specialty stores and enjoying a vibrant night life. The Downtown St. Louis residents are served by the St. Louis City School District including Vashon Senior High. See Great Schools for up to date ranking on every school in the area. If you are looking for a loft for sale in Downtown St. Louis MO or you would be interested in buying a home in Downtown, St. Louis, please contact St Louis County real estate expert, Sharon Colona and St. Louis Realty for a professional and simple buying or selling process. Call (636) 397-7653 or email at scolona@stlouisrealty.net. OPEN HOUSE THURSDAY 4/18/19 4:30-7:30pm! Come see this stunning restoration before the show! Next-door to Jazz St. Louis & the Fox Theatre in the heart of Grand Center, this 5,000+sf space has been beautifully restored. So much attention to detail throughout this renovation process! Gorgeous fireplaces, 12 x2019; ceilings, beautiful pocket doors/woodwork, hand painted & stenciled accents, and the list goes on. Currently used as office/law practice, can be used as both commercial and/or residential. Full kitchen & two xBD; baths on 1st floor, stunning common rooms, offices, dining or living rooms, 2nd floor has 3 addt bedroom ensuites or private offices, 3rd floor is open for large bank of cubicles, art studio, so many options. Roof top deck with amazing views, 2 car garage+3 addt gated spaces, partially finished lower level with walkout to garden. Grand Center common area in front, next door to Jazz at the Bistro, Fox Theater, Powell Symphony Hall. Could be speakeasy, art gallery- Many Options! Welcome to downtown x2019;s most eligible penthouse! Truly a one-of-a-kind space - this one pretty much checks ALL the boxes. Nearly 3,800 square feet of living space. Parking for 3-4 cars. Two outdoor spaces (balcony AND private rooftop deck). Three large bedroom suites. Three full bathrooms. Dry sauna. Modern fireplace. Gas cooking. Open-air kitchen. Expansive views to the north. HUGE custom laundry room. Extra private storage. And a prime location within steps of everything. Now let x2019;s talk about the interior which is such a gorgeous space! You'll LOVE the open yet intimate feel highlighted by a stunning industrial chic design. The polished floors are amazing and are the perfect compliment to the wood-beamed ceilings. This is an entertainer's dream perfect for dinner parties & social events but is also the perfect pad to just relax with family and friends. Be inside, be outside, play games, BBQ on the deck, watch the night sky, play a game of pool and on and on. Your excitement awaits! Welcome to the Alexander Lofts in the heart of downtown. With the Alexander Lofts each owner enjoys the privacy of the elevator opening directly to their own unit. This open style floor plan features 14' ceilings, maple wood flooring & exposed brick. The high-end kitchen features custom cabinets, granite counter tops, stainless appliances & a gas range. The master suite features a large walk in custom closet, a private balcony, and luxurious master bath with a large walk-in shower. A second spacious bedroom and full bath complete this fabulous home. This unit includes two side by side garage parking spaces and a storage unit. Don x2019;t miss your chance to see this unbelievable space! WHAT AN AMAZING VIEW FROM THIS UNIQUE CONDO! This unit has a breathtaking panoramic view of the City! The custom kitchen with granite counter tops, custom cabinets, high end stainless steel appliances, and wine cooler will knock your socks off! As you step down from the kitchen, you experience the openness feel of the living room which is great for entertaining. The master bedroom is located on the main floor and is very spacious with a hug master bathroom! It has everything upgraded including a whirlpool tub, glass enclosed shower and two sinks. The second bedroom has brand new carpet and a closet large enough for a master bed! This unit features a large loft area overlooking the living room which would be great for a possible third bedroom or living quarters. This one and only unit provides immediate access to the rooftop pool and your own private deck! THIS IS PRICED TO SELL! STUNNING 2-LEVEL PENTHOUSE! Put this one on the list to see. This is one of those condos that feels oh so good as soon as you step in. It offers the rarely found three private bedrooms (all have windows), private outdoor space via the large balcony and garage parking that will fit 3 cars! Jump on this before it x2019;s too late! The interior is open, airy and full of natural light coming in from two sides. You x2019;ll love the soaring ceilings with wood beams spanning the living areas. Kitchen is open-air with high-end finishes and center island. Floor plan is exceptional offering many options of usable space. Master bedroom is fantastic with big walk-in closet and gorgeous master bath! Second bedroom & half bath also on main level. Upstairs is another great bedroom with a beautiful bathroom and super nice living room with center fireplace. Just too many nice things to list! Come see it! Amenities - club room, courtyard, fitness, art galleries, workshop, meeting room, storage and rooftop deck. AMAZING Penthouse showcasing the Entire Eastern City Scape including the ARCH! Floor to ceiling windows stretch across as you enter! Your guest will be WOWED by the intentionality & exquisite design. A ONE Of a Kind front facing 400sq foot private deck w/unimpeded Eastern views, gas lamps, & a 4 Season television. The chef's kitchen has loads of custom cabinets, dazzling granite, sleek backsplash, GAS stove, & pantry. Tremendous living room bright, beautiful, views & open-Great for Entertaining! Sleek Hardwoods throughout & metal ceilings add a pop. Dreamy Huge Master Suite including private deck, floor to ceiling windows, loads of space, & out of this world custom built closet! Gorgeous Master Bath w/Jacuzzi corner tub, oversized shower, & custom double bowl vanity! Ideal spacious guest bedroom, sharp guest bath, & office easily converted to a 3rd bedroom! Steps from Roof Top Pool, NO neighbors, & 2 garaged spaces! U will love this House Like Penthouse! Sleek city-living at it's finest. With 12ft ceilings, exposed brick. original maple hard-wood floors, and 60+ft of southern-facing windows, this home is sure to energize and vitalize. The gourmet kitchen includes a huge center island with sink, built in dishwasher, range, microwave, warming oven, wine cooler, and large refrigerator! xD; xA; xD; xA;Master bedroom features a 15ft, ornate glass wall on a stainless steel beam and walk-in closet. The master bath offers a 6ft jetted tub, towel warmers, heated tile floor, and walk-in shower. This truly is luxurious city living. The space also showcases flexible room design with the ability to have 2-3 additional bedrooms or an office, media room, etc. xD; xA; xD; xA;Unit includes indoor parking (one assigned space plus one lift space), access to community roof-top deck, internet, and on-site cleaning and maintenance. Within walking distance of restaurants, sporting events, and the Arch. Luxury 2 story penthouse loft in a premier location! Professionally designed, stylish & tasteful, this loft is ideal for your urban living dream! Walk into an open floor plan w/featured natural timber posts, wooden ceilings, exposed brick walls, polished concrete floors & ample amount of natural light! The main floor boasts custom designed kitchen w/ 42 cabinets, large center island w/breakfast bar & gas cooktop, granite countertops and SS backsplash! Gorgeous master suite w/wood ceiling, designer light fixtures, exposed brick walls & a huge master bath finished in elegant colors featuring dual sink vanity, large soaking tub, & a separate shower with subway tile surround and frameless shower glass. Main floor laundry & half bath complete 1st floor. Upstairs features 2nd bedroom w/hardwood flooring & a full bath finished in slate tile. 2 garage parking spaces. Private rooftop patio is perfect to unwind from the day & spend your evening enjoying the beautiful view of downtown St. Louis! Amazing 3 BR double loft (unit 206 & 207) built for builder, has beautiful amenities & upgrades in addition to the awesome architectural details. Lots of exposed brick, concrete columns, exposed wood beams & 20' ceilings. Over 2500 sqft. XL 2+ pkng space in underground garage, roof top pool + storage unit. The main area is wide open, has wall of windows providing tons of natural light. Kitchen has 42 maple cabinets, stainless appliances, built in microwave, oven, gas stove & stainless hood, granite & Breakfast Bar. Was divided into a Dining Rm, Office & Great Rm, the rest of the area is adorned w/ more concrete columns, Bar area, iron door + Great Rm has see through fp to the Master BR. The 15' ceilings are amazing adding more grandeur to this luxury loft. The Master BR Ste has a custom closet organizers, newer, large glass shower open to tub double bowl vanity, private toilet area & separate vanity. No show until 2/9. Mnthly fee includes water, trash, sewer, cable and internet. Where Urban Living meets art & unique function. Located in the heart of Loft District in the sought after Banker's Lofts Building allows for walkability & prestige. Open loft floor-plan with 12 x2019; ceilings plucked out of Architectural Digest. State-of-the-art design unmatched in any other building. Corner unit w/no adjacent neighbors allows for serene living at its finest. Oversized insulated windows, exposed heavy timber construction w/seismic upgrades, 42 maple slab cabinetry, granite countertops, double ovens, Gas range, Kohler plumbing, oversized walk-in closet, frameless walk-in shower & ceramic surround, soaking tub w/ceramic tile & upsized water lines, oversized secure storage area (adjacent to unit), ground level secure/climate controlled parking, 2 elevators, central looped hot water system, 2 common rooftop decks, fitness room, the list of amenities is long & distinguished. Just a few short blocks from all that makes St. Louis and living downtown your desired destination. No showings until Premier Open 2/9 from 11-1pm. Welcome to 1010 St. Charles St. right in the heart of Downtown St. Louis! Find everything you love about Loft living - exposed brick, 12ft ceilings, open ductwork and oversized windows. Travel on original maple floors into the wide open floor plan, perfect for entertaining. The Kitchen, fully equipped with stainless appliances, cabinet storage, and breakfast bar, overlooks the open Dining area with modern light fixtures. Cozy up with a movie on the 130 inch projection TV in the Living Room. Enter through historic double doors into the spacious Master Suite with dual walk-in closets and luxurious bath with vessel sink, separate jet tub, and oversized shower. Just down the hall you x2019;ll find a full bath and additional bedroom with walk-in closet. Both bedrooms have access to private, screened-in porch. Complete with in-unit washer & dryer and attached garage parking (#504). Just minutes from restaurants, entertainment, and transportation!